The PenFed Power Cash Rewards is either a great or excellent credit card, depending on which of its two rewards rates you can qualify for. Anyone accepted for the card can get at least 1.5 % cash back, which is decent on its own. However, those who meet certain eligibility criteria, which we outline below, can get a 2% cash back rate on all purchases, which is a rare sight among even the best credit cards. How Does It Compare to Other Cards? The PenFed Power Cash Rewards is a good cash back credit card anyway you slice it. The base 1.5% cash back rewards rate is solid and competitive. It can hold its own against even the top cash back credit cards, including the Chase Freedom Unlimited® or Capital One® Quicksilver® Cash Rewards Credit Card. If you meet certain eligibility requirements, the card can give you a 2% cash back rate on all purchases, which is as good as any fixed-rate cash back credit cards gets. If you don't have the necessary qualifications to get the 2% rewards rate, consider applying for the Citi® Double Cash Card instead. The bonus on the PenFed Power Cash Rewards has room for improvement. Users can earn $100 after spending at least $1,500 on purchases within the first 90 days of account opening. Most cash back credit cards typically award a similar bonus for spending far less money. We typically see just a $500 spending requirement for a $100 prize. Therefore, you are working three times as hard to get the same bonus that you could get on other cards of this type. One final feature worth noting is the card’s balance transfer capabilities. You can get a promotional 0% interest rate on balance transfers for the first 12 months your account is open. While that's a nice feature, if you are looking for a card to serve this function, there are far better options available. The best balance transfer credit cards offer longer 0% APR periods and some even waive the 3% transfer fee you’d have to pay with the PenFed Power Cash Rewards. Bottom Line: The PenFed Power Cash Rewards is a fantastic new credit card, especially if you are a current/former military member. Those who can qualify for this card’s 2% rewards rate on all purchases will be hard pressed to find many other card offers that could top this it. The PenFed Power Cash Rewards offers up a 1.5% cash back rate on every purchase. If you have an Access America Checking Account or are a current, or former, military member you can receive 2% back. The card also has a $100 spend bonus that kicks in once you spend at least $1,500 within the first 90 days of account opening. In addition to the cash back rewards, the PenFed Power Cash Rewards doubles as a balance transfer credit card. Cardholders can receive 12 months of 0% APR on debt they move over to this card. That gives a year of no interest to allow cardholders to pay down their principal debt. For the average indebted household, who currently carries around $16,000 in credit card debt, that can save approximately $1,551 over those 12 months – assuming the cardholder can afford $1,000 monthly payments and is moving from an APR of 15% (the national average). Like with all PenFed credit cards, you must be a PenFed member to apply for the PenFed Power Cash Rewards. If you serve in the United States military or uniformed services, are a U.S. government employee, or are related to someone who is, you probably qualify for membership. If none of those things apply to you, it’s still possible the join by becoming a member of an eligible group. Civilians, for example, can join the National Military Family Association. Doing so costs a one-time $17 fee, and allows you to join PenFed. To get this card, you also need to open a regular share account with at least $5 deposited to it. How Does The PenFed Power Cash Rewards Compare To Other Credit Cards? To get a better sense of how good the PenFed Power Cash Rewards is, we compared it to other credit cards available. Below we compared and contrasted the most relevant features for each match-up. The Citi® Double Cash Card is one of the closest cards you can get to the PenFed Power Cash Rewards, without having to join PenFed. The card awards 1% cash back on all purchases, and another 1% back as you pay. The Citi® Double Cash Card does not come with any bonus, unlike the PenFed Power Cash Rewards. Therefore, assuming a similar rewards rates on both cards, the PenFed Power Cash Rewards will provide consumers with the better short-term value, and a bigger gross return on spending overall. 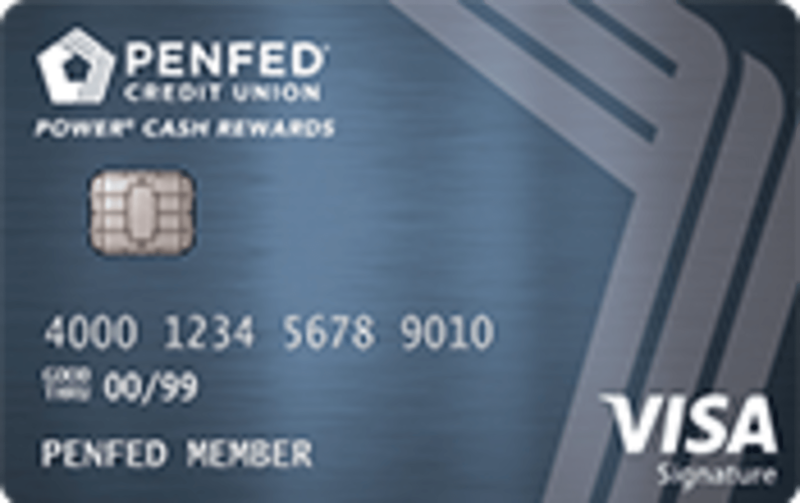 The PenFed Platinum Rewards VISA Signature® Card is another flagship PenFed credit card, and it can be better for some consumers than the PenFed Power Cash Rewards. It all comes down to how you spend and your personal taste. Instead of cash back, this card awards 5 points per dollar at the pump, 3 points on all supermarket purchases, and 1 point per dollar elsewhere. How you use these points will greatly determine your rewards rate. For example, exchanging them for gift cards gives you about $0.008 per point, which works out to a 4.3%, 2.6%, or 0.08% rewards rate – depending on where you shop. So long as your average rewards rate comes out above 2%, you should get this card over the PenFed Power Cash Rewards. Figuring out that math may be tricky, so we suggest using one of our calculators instead. 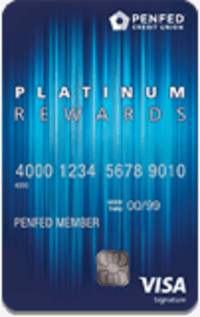 Don't apply for the PenFed Platinum Rewards VISA Signature® Card unless you are willing to spend some time figuring out the best use (and value) for your points. The Chase Freedom Unlimited® is one of the best cash back credit cards in the business. It offers 3% cash back on the first $20,000 in purchases during the first year. After that, the card offers an unlimited 1.5% cash back rate. The great thing about this card is that you'll know what you're earning each time you use it. It doesn't require you to keep track of rotating categories like other popular cash back credit cards. How Does The PenFed Power Cash Rewards Compare Based On How You Spend? If you’re having a tough time deciding between all the options, feel free to use our comparison tool below. Input your estimated monthly spending into the calculator, and it will estimate the value of each card given your profile. This saves you from having to do all the calculations yourself. Note: We assume a 1.5% rewards rate on the PenFed Power Cash Rewards. If you can qualify for the 2% cash back on the card, simply multiply the estimate we give by 1.3 to get a better estimate.